We love Easter. The school holidays, family time, great food & fun. Be sure your fridge is well stocked with sausage rolls for when the kids complain about being hungry. Our roast pork & beef is ideal for sandwiches too. 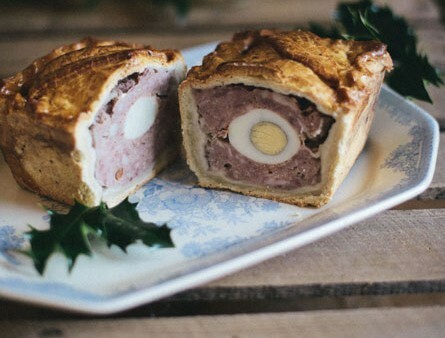 How about a picnic in the park, we’re thinking pork pies & scotch eggs for everyone. Don’t forget to host a fabulous Easter feast for the entire family. We’ve got quality local meat for your plate. 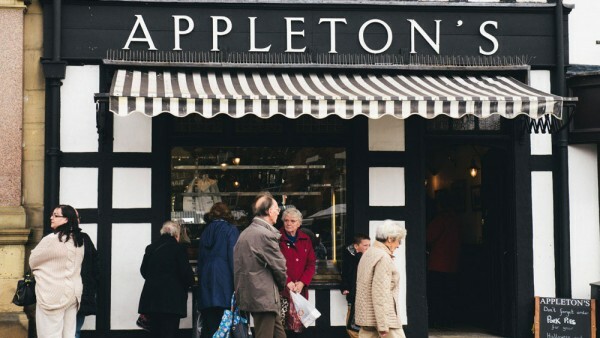 Shop at Appleton’s Butchers in Ripon, Boroughbridge, Wetherby & York where you’ll find fantastic customer service & incredible produce. With Mother’s Day coming up this week, what better time to treat your Mum to a delicious meal? You don’t need to go out for good food. 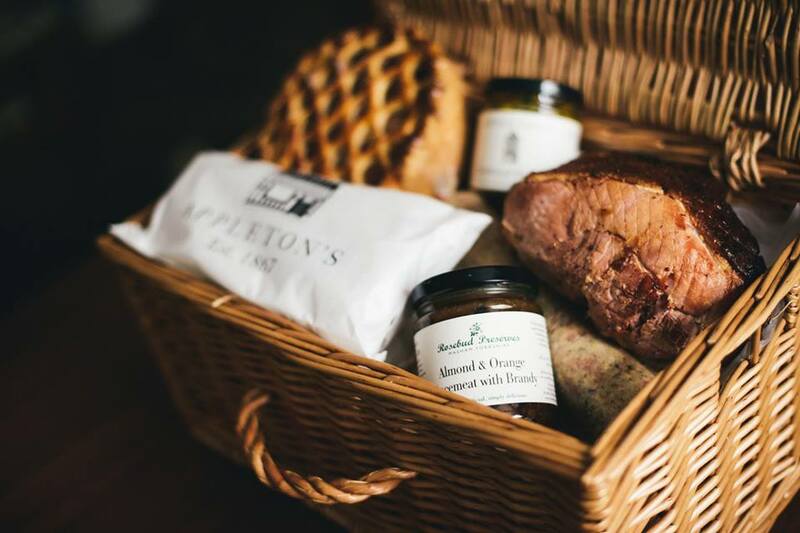 Cook it yourself using delicious local meat from Appleton’s Butchers. You could even treat your mum to an Appleton’s Breakfast on Mother’s Day. 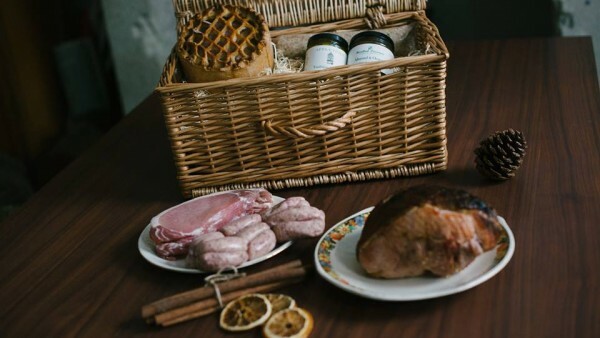 The breakfast hamper includes 6 rashers of dry cured Yorkshire bacon, 6 thin Appleton’s sausages, 1 link of our own black pudding (or 2 tomatoes if you prefer) and 6 very large eggs. All this for just £6 – offer ends on Saturday 30th March 2019. Visit our shops in Ripon, Wetherby, Boroughbridge & York where you’ll discover high quality meat & great customer service. Make sure to spoil your Mum this Mothering Sunday & treat her to a pie too! Happy Mother’s Day! Please find our Christmas order form along with opening hours at the back of our Christmas Brochure for over the festive season, including New Year. You can download (right click & ‘save image as’) and then print your order form yourself below or pick one up instore. Please see the form for information on last order dates and all the prices. Seasons greetings! Congratulations ladies, if you proposed on today (February 29th) & your loved one said yes! Another four years until tradition allows the girls to ask again! Let the wedding planning begin! The Appleton’s Butchers team love weddings. Have you decided where you’ll have it? Who you’ll invite? What you’ll eat? Well, let us take care of that for you. We have a fantastic & affordable option that your guests will enjoy. A delicious hog roast is the perfect option for your wedding reception! 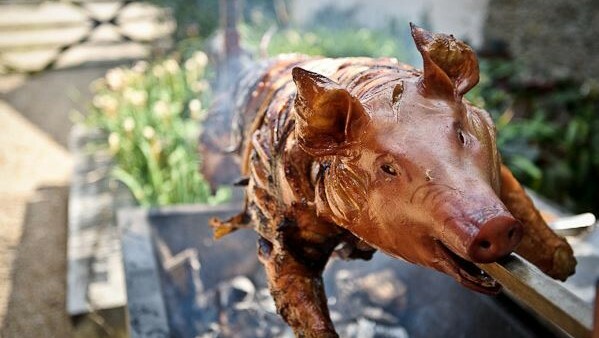 We only use the finest local rare-breed pigs for our hog roast service. Our packages offer two options, so we can deliver everything you need so you can do it yourself, or we can organise & execute everything for you, right down to the apple sauce – hassle free! 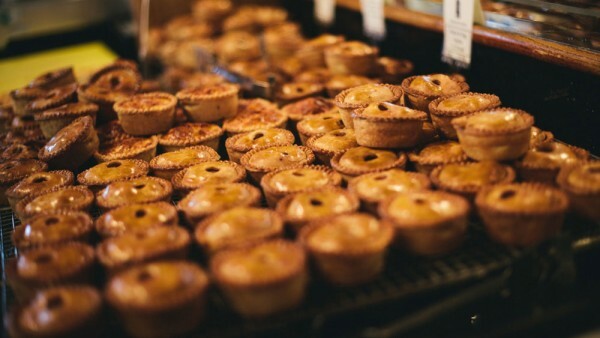 Of course, if you love our pork pies, we can always bring a selection of them along for your big day, a hog roast sandwich & a pie will set everyone up for dancing the night away! You could even consider a pork pie wedding cake! Many congratulations once again & we wish you the best for your wedding planning. If you need us, just get in touch! 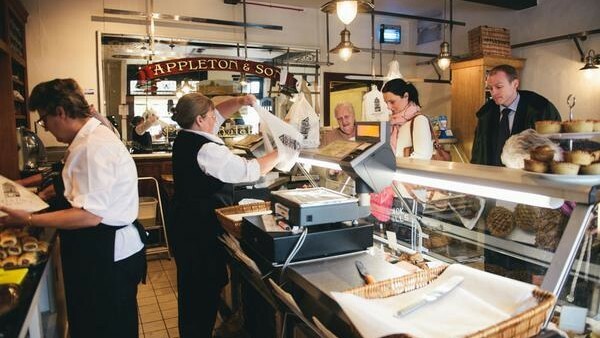 Here at Appleton’s Butchers we encourage our customers to shop local & support their local businesses. We have two shops, one in Ripon & the other in Wetherby and there is so much to enjoy in both towns. By supporting indie businesses it helps to keep the town alive. Back in December there was the second annual Shop Local Saturday which is a nationwide campaign designed to encourage local shopping. All year round is ideal though, and we believe the produce & goods are far better when you go to the individual experts. We activity include #shoplocal in our tweets & hope our Twitter followers take notice. The annual day of love is on the way and we thought it would be a great idea to give you a quick reminder and some gift ideas too! Start the day off right with a delicious cooked breakfast. Fortunately Valentine’s Day falls on a Sunday this year so there is no rush to get out and about. A delicious cooked breakfast including Appleton’s bacon, sausages and black pudding will be a wonderful start to the day. Don’t forget that we have hampers too, ideal for foodies! 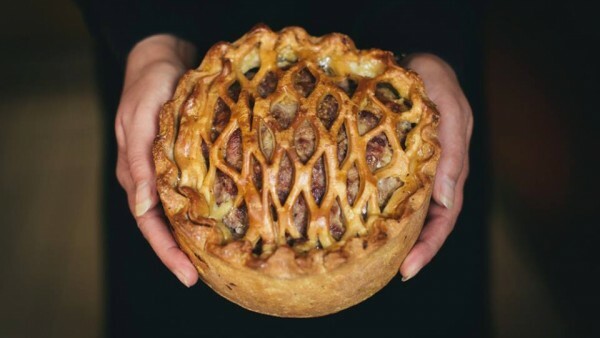 Plus, we think there is no better present to show someone you love them than a pork pie! Imagine receiving a Valentine’s Day pie from a secret admirer, we’d be blown away! If you’re spending the day as a family, one of our steak pies is perfect for a quick and easy tea, which means no one needs to slave away in the kitchen. You might fancy doing something a little bit special – check out these inspired Valentine’s Day pork recipe ideas if you’re staying in & cooking for your loved one. Have a lovely Valentine’s Day folks! It’s always had a bit of bad press. People either love it or can’t stand it. 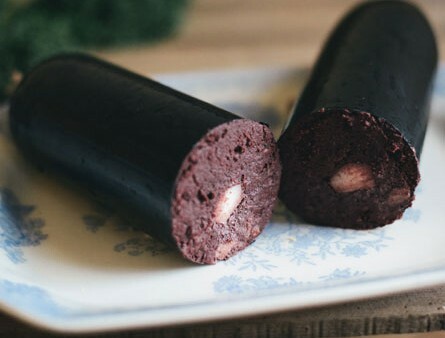 We’re talking about Black Pudding and its new status as a superfood! Black Pudding has been hailed as one of the superfoods on 2016. Loaded with protein, potassium, calcium and magnesium, as well as being practically carb free, it is expected to fly off the shelves. It’s also rich in iron and zinc – two minerals frequently missing from modern diets. Iron is needed to make healthy blood cells and prevent anaemia. Let us know your thoughts over on our Facebook page. You know where to come to get your local Black Pudding! We wanted to take the opportunity to wish you all the very best for 2016. Happy New Year! Our shops are back open as usual, serving the best pork around to our fantastic customers to beat those January blues. Come visit us in Ripon and Wetherby where our friendly staff members are more than happy to help. 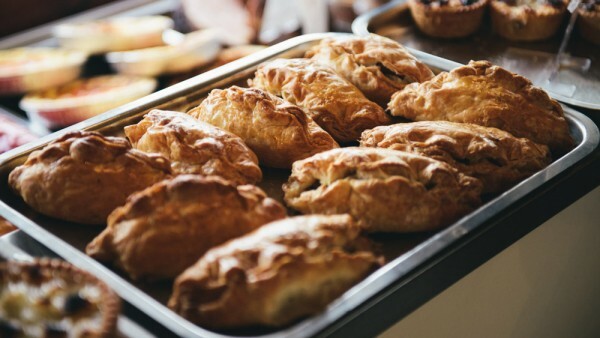 Whether it’s bacon for mid-morning sandwiches, sausage rolls for the best packed lunch in town or perfect pork for slow cooked pulled pork with friends, we have something for everyone. 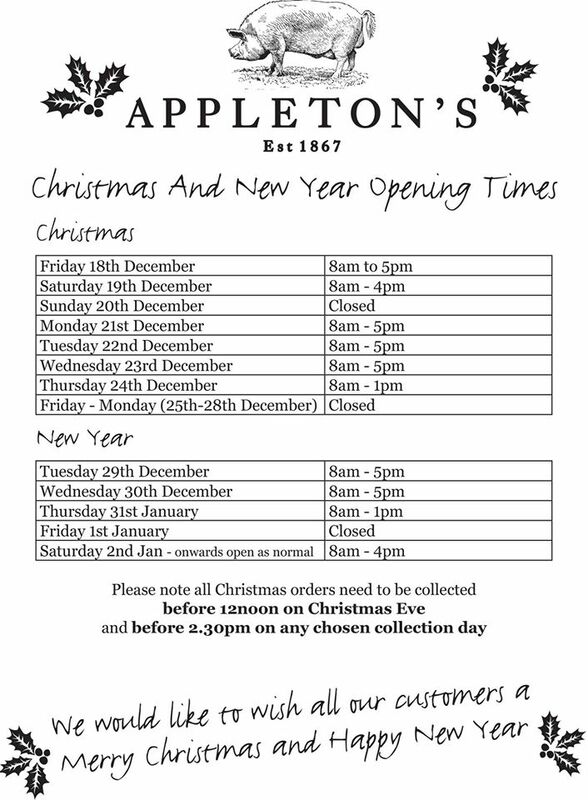 Shop local this year at Appleton’s Butchers. Christmas is fast approaching, you can almost hear the “Ho-Ho-Ho” from the big guy in the red suit & we’re pretty much run off our feet in the shops getting orders ready for our amazing customers. Our shops are open until 1pm on Christmas Eve. If you’ve got an order to collect, don’t forget! Please see our Christmas & New Year opening hours here. Make sure you have plenty of sausage meat, bacon, pies, scotch eggs, best quality pork and more for the holidays ahead by visiting our shops in Ripon & Wetherby today! Let us take this opportunity to wish you all a very Merry Christmas, on behalf of all the team at Appleton’s Butchers. Have a fantastically festive time! 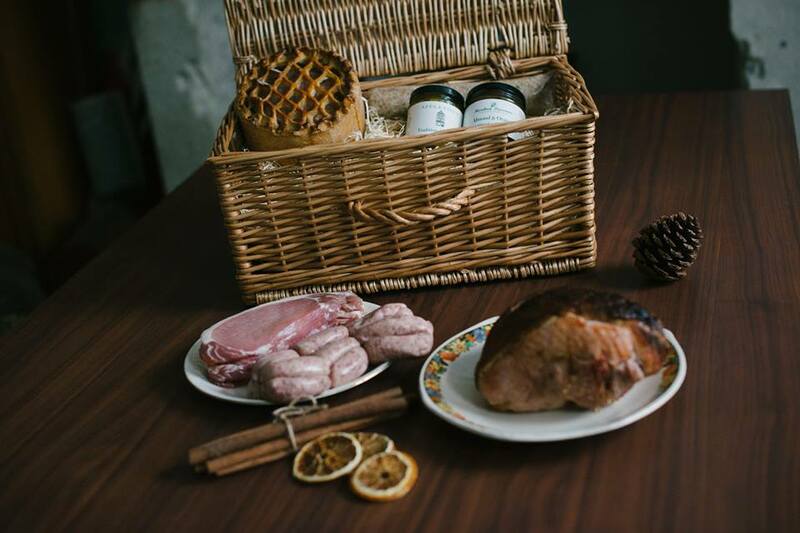 Christmas is the time for giving and what better gift to give than a delicious hamper, full of wonderful local produce. 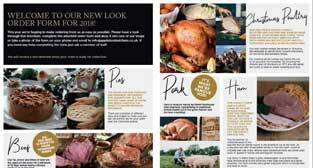 From pies to pork sausages, condiments to cured meats, not only is it a perfect gift for a loved one this festive season, it’s also the ideal centrepiece for your Christmas, allowing for the best pigs in blankets with your turkey, the tastiest pies on your buffet table and brilliant bacon sandwiches on Boxing Day morning! Our hampers start from only £25 and are available to order now. You can collect them at either of our Wetherby or Ripon shops, on a day of your choice in the week leading up to Christmas. Please note, orders must be collected by 12noon on your collection day and our shops will close for Christmas at 1pm on Christmas Eve. 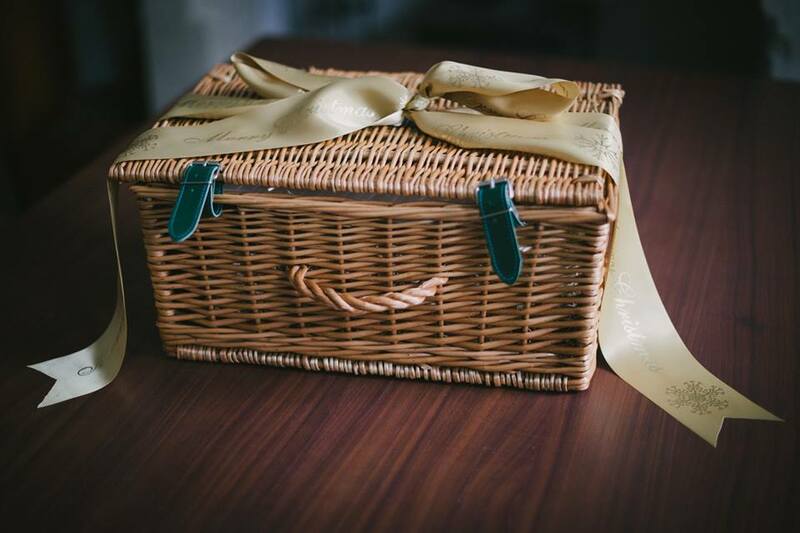 Take a look at some photos of our hampers below, they’ll get your mouth watering! Download your order form now! Merry Christmas!